Saturn is one of the planets we often fear transits in dissonance. And yet, in an apparent rigidity, this planet teaches us patience, humility and wisdom. Each dissonant transit over other elements in the chart, the Sun to the lunar nodes, is analyzed on all levels: physiological, events, spiritual and karmic. A4 PDF document - 42 pages approx. SATURN IN DISSONANCE WITH THE NATIVE SUN In general we connect the Sun to personality and energy and that's when the transit of Saturn is going to happen. During this transit the sunbeam won't work as much as usual. The energy will be reduced as well: we may be tired, cowardly, and sometimes during the day we may feel drained. Moreover, we also may feel down: we are nervous about irrelevant things and our future doesn't seem to be as bright as usual. Our personal ambition is decreasing just as much as our creativity. We may step back for a while even though we are no artist. People around us don't need our company anymore. That's why we tend to isolate from people in general. Overall this phase is about loneliness , but we may unconsciously try to stay like that (analyzing the aspects that connect Saturn to the Sun will give you some information about it). « Vanity of vanities, all is vanity », we understand better the meaning of this maxim during the transit: we realize our joy for life is connected to the personal enthusiasm we develop at the same time. However if during a dissonant transit of Saturn we are realistic… we might not be lucid. We tend to dramatize to the point where everything is negative. It's only at the end of the last phase at the forward stroke that we realize there's a positive aspect and that it's also beneficial. On the factual plane, you may show your lack of energy and goodwill by being discouraged towards trials and tribulations. You realize you are not getting any younger, that you are not as energetic as you used to be and you become aware of what makes you sad and pessimistic. We sometimes feel like everything is against us. The help provided doesn't change anything and we feel like we are unlucky every time we try something new. During this dissonant transit we are aware of social inequalities, political skullduggery, drama and disasters on TV. We feel like we live in a cruel and unfair world and we feel so guilty towards poverty. But it's also obvious that we tend to dramatize, that's why we can be biased. As a matter of fact we tend to enjoy complaining, protesting, rebelling, and this will make relationships with your people much harder. On the spiritual and karmic plane, the dissonant transit of Saturn to the native Sun will make you realize time is passing. We can feel we are aging, growing, changing, meanwhile we know it's not a bad thing. Indeed, Saturn asks our Sun for some personal efforts. It also asks us to assert our personality and to take on our responsibilities as far as the way we want to climb the social ladder. Subordinate situations or compromises aren't enough anymore. Saturn is like a judge inside of us who asks for some respect and dignity. Saturn is our instructor. As a matter of fact, it seems relevant to leave Saturn where it's supposed to be as far as the remit some astrologists give to this planet. If Saturn represents the father in a few charts, it's because education is mainly given by the father. However in single-parent families, the part of Saturn is played by the mother (Moon). Render unto Caesar (the Sun) the things which are Caesar's! Anyways, the father and education are involved in this dissonant transit, moreover the father may go through some preoccupying issues. Whether or not we accept his piece of advice, we will have to take on our duties and responsibilities. In the birth chart if the Sun is in dissonance to Saturn, it might be in opposition to itself, or in square, or back to the degree it has in the zodiac. In the first case, it's obvious there's a rebellion against education or the father. Indeed it's around the age of 14/15 years old that we become more mature, age of the Saturnine semi-revolution. In the second case, the native square that goes on over and over again means that we may go through physical or psychological stuff. In the third case comes the « return of Saturn » that happens every 29 years and most of the time we take stock of our social situation. 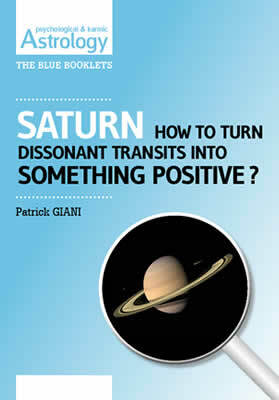 In any case the transit of Saturn isn't an easy phase, our vitality is decreasing and we may be in poor spirits. If the Sun is in dissonance with lunar nodes, Saturn will stop by one of the nodes and will force us to express ourselves and fulfill our dreams even if we have to go through a rough patch. If Saturn is in transit to the south node, it may reactivate a karmic activity in order to challenge the Sun. We have to take into account the houses that are involved and aspects connecting those two planets to the other points of the chart. If Saturn is in transit to the north node, this planet won't have to go through the same things, however it will focus on responsibilities to take on in the immediate future. études et logiciels d'astrologie who are we ?